I love to play around with my set of clubs. Every time I make a change I think I have really got it this time. The clubs from the 16.5 fairway wood to the lob wedge have fairly consistent gaps in loft. I’ve really got it this time. You read that right. OnCore Golf is planning to demonstrate a golf ball in January 2018 containing sensors that give you a full read-out of your shot, which is accomplished using a mobile phone app. It keeps historical data, too, of your play on any course. Read about it here: http://tinyurl.com/y93d39y9. Public release is scheduled to occur in June 2018. The projected price is $49.95 for a sleeve of two Genius Ball golf balls. What an age we live in. Play with your equipment. Mix it up. The clubs you put in your bag dictate how you play the game. This is how I’m playing this spring. No fairway woods, one hybrid, and a left-handed club. Really, I only need the thirteen clubs to get round the course in fine shape. The left-handed 9-iron is the ultimate trouble club. Next to a tree or other object with no right-handed swing available? Ball beside a deep bunker you would have to take your stance in to swing right-handed? A little chipping stroke will do, and it’s not that hard to learn how to swing from the other side. Let’s see how many strokes it saves me this year. Unless you are a very good player, there is a gap in your golf game that you likely cannot close. That gap is between your 4-iron/24° hybrid/7-wood and your driver. Within that space, recreational golfers generally do not have a good chance to hit greens and make pars. The solution is to judge the conditions carefully if you have a long shot into the green. When there’s no real trouble around it, then go for it IF you can get there with a club you get into the air easily. If you miss the green, you’ll at least be hole high with a chip onto the green for a par putt and a sure bogey. Nothing wrong with that. What if there’s trouble in the form of bunkers, water, tall grass? Now it might make sense to play short to a long chipping position. In that case, hit the shot with the longest club you have confidence in. That way, you’ll eat up a lot of yards, be in front of the green with a good lie and a chance, again, to chip on for a par or a sure bogey. If you have a gap like the one I’m talking about, and I do, it’s best to think of the longer clubs as advancement clubs — clubs that get your ball down the fairway without the risk of losing strokes. Or, you can go one step farther and not even put them in your bag. That way, they will never get you in trouble. I like a light bag, so I carry only 10 clubs. The set starts off with driver, 24° hybrid, 6-iron and on down stepwise to a 56° wedge and my putter. No 5-iron? I hit it well, but not often enough to carry it. I hit my driver 220 yards. With a 175-yard second, I can reach the green on all but the longest par 4s. Long par 3s are hard to hit anyway, so playing short and safe works out better than playing long and into trouble. Par 5s are three-shotters, and 395 after two shots leaves a short iron into the green. I’m not asking you to play wimpy golf. Not at all. 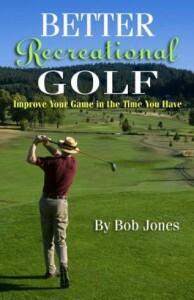 I‘m suggesting that you be realistic about how to play from long distances so you don’t lose strokes needlessly. The pros play golf one way. We play it another. When you’re ready to hit into the green from 200 yards without courting disaster, you’ll know. If you use a laser rangefinder on the golf course, you get an accurate distance to the pin. It would be nice to know where the pin is in relation to the center of the green, though. A location indicator attached to the pin, or on the 150-yard marker, if they’re used, is only an approximation. As you’re approaching your ball, and before it’s your turn to hit, find a sprinkler head with a yardage affixed and stand right above it. Shoot the pin and compare the difference between the yardage to the pin and the yardage shown on the sprinkler head. If the sprinkler head yardage is higher, the pin is nearer to the front of the green. If the sprinkler head yardage is less, the pin is nearer to the back of the green. Most of the time we are short with our approaches (but that’s another post). If you know because of what you just found out that the pin is toward the front of the green, you might what to take a longer club to make sure your ball gets to the green. If the pin is behind the center of the green, you can take less club and hit an easier shot, knowing that you still have enough club to get the ball onto the green. Remember, most greens are at leasts 30 yards deep, which gives you plenty of room for error. I played nine holes this morning with five clubs: driver, 4i, 7i, 54 wedge, putter. The only thing that went wrong was on the first hole. I thought I had taken along a 56 wedge. It was a 54 and my pitch on to the green was way overcooked. Other than that, I shot the same score I usually do and had to hit a few creative shots I don’t otherwise get to hit. The golf club’s shaft runs down to the hosel, which takes off at an angle to the clubhead. That angle, called the lie angle, contributes to the direction the ball goes when you hit it, and more. Golf club manufacturers build standard lie angles into their mass-produced clubs. There’s a good chance the standard lie angles do not fit your physique and swing, just like a suit off the rack in your size fits sort of, but not quite right. Just like you would get that suit tailored, part of a club fitting is getting the lie angle right. The more lofted the club, the more pronounced this effect is. In addition, a club with the wrong lie angle will tend to strike the ball with a glancing blow. That will cause you to lose distance, the ball will fly lower and have less backspin, and the strike will never feel solid. There’s an easy way to check whether the lie angle on your clubs is right for you. Get a Sharpie with a wide tip and draw a line on the ball. Put the ball down so the line is perfectly vertical and against the clubface when you address the ball. Now go ahead and hit the ball. If the lie angle is correct, you will have a vertical stripe of ink on your clubface. If the lie is too upright, the stripe will lean toward the toe. Too flat, toward the heel. If there’s something wrong, get it corrected. This is a simple adjustment on a loft and lie machine. The reason you want to get wrong lie angles corrected is that if you don’t, you have to introduce a compensation into your swing to make the ball go straight. It’s a lot easier to fix the club than to adjust your swing. Get the lie angle on your irons checked every year if you play a lot of golf. Repeated impact against the ground can cause this angle to change. You can use the theory of lie angles to help you play a shot from a sidehill lie. Imagine the ball being above your feet. When you address the ball, the bank raises the toe of the club, making the clubface point left of the swing path. So, aim right to compensate. The opposite is true when the ball is below your feet. The clubface is now facing to the right, so aim the shot to the left of your target. Over the years I have posted the composition of my playing set to let you know where my thinking is going, and just to have some fun. This year I’ve stopped turning in scores for a USGA handicap (never used it anyway). I simplified my swing to take the load off my back. I simplified my bag, too. That’s it. Seven clubs. Lets me carry, which gives me a greater sense of communication with the course and my shots (whatever that means). Also forces me to be creative, which is lots of fun. How am I doing, scoring-wise? I played the back nine one Monday morning and shot 38. I played the front nine the next Monday morning and shot 36, from tees appropriate to my length. Can’t say I miss the clubs in the gaps. During the golf swing, the shaft bends in so many ways and in so many places that we wonder how the ball can be hit straight. But it all works out. Read this description of something that looks simple only when we see it at high speed. The clubhead of an iron weighs about eight ounces. The entire golf club weighs about fourteen. When the club moves away from the ball, the flexible shaft gets ahead the movement of the clubhead; that is, the shaft bends in a concave direction in regard to the target. The clubhead remains in this lagging position throughout the backswing. At the top of the backswing the clubhead catches up again just before the reversal of direction the swing. But as before, when the clubs starts swinging down, the heavy clubhead gets left behind, bending the shaft again, but in the opposite way than it bent at takeaway. The downswing accelerates the clubhead, whereas the backswing it was decelerating. At some point in the downswing, the accelerating clubhead passes the shaft, causing the shaft to bend in the opposite direction, a concave shape relative to the target, as the clubhead approaches the ball. 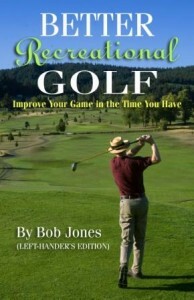 The clubhead now behaves as if it were a freewheeling object. This bending of the shaft causes the clubface to be closed at impact by about 2 degrees. In addition to being bent a bit backwards, the shaft also bends downward, somewhat like a fishing pole bent downward by the weight of the lures tied to the line. This downward bending causes the lie of the club to flatten out, and must be taken into account when the lie of the club is determined during club-fitting. The amount of the bend can between from 1 to 3 degrees, depending on shaft flex and clubhead speed. So again, we manage to hit the ball straight in spite of this high-speed noodling. Knowing this makes golf a little more interesting, but don’t get caught up in all of it when you swing. Let this be something that keeps club designers awake at night. 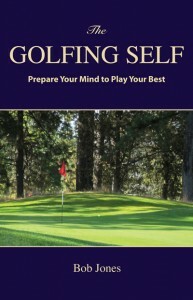 My new book, The Golfing Self, is now available at www.therecreationalgolfer.com. It will change everything about the way you play. When I began playing, a set of clubs was four woods (1, 2, 3, 4), nine irons (2-9), a pitching wedge and a putter. Most people swapped out their 2-wood for a sand wedge. A few people traded their 2-iron for a 5-wood. That was about it. A half-set for beginners was sold, consisting of a 1- and 3-wood, the odd-numbered irons, and a putter. I don’t think half-sets are sold anymore, though they should be, to make it less expensive for beginners to get into the game. As far as the composition goes, you could trade the 3-iron from a modern set for a 21-degree hybrid and you would have it. Whatever clubs you have in your bag, make sure there is a reason for every one of them to be here. You’re allowed fourteen clubs, but you don’t have to carry fourteen. Also, every club except maybe the driver should be able to multi-task. If not, either learn how or get rid of it.